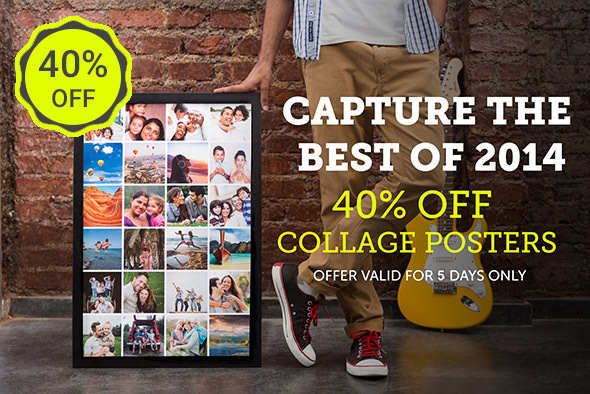 Discount Coupons & Offers: Capture the best of 2014 – 40% off collage posters. Capture the best of 2014 – 40% off collage posters. With the end of another year there is never a shortage of amazing memories. From fun weekends with your friends, quality time with the family, or an adventure in a new place, capture all that 2014 brought you with our collage posters. Your favourite moments in one place! ✓ 3 sizes – a modest 12"x18", an impressionable 15"x20" and a statement-making 20"x30"
Hurry, this deal is valid for 5 days only! Offer available only on Android. Posters coming soon to iOS. Offer valid on 12x18, 15x20 and 20x30 sizes. No coupon code required. Select offer from the offers tab to avail the discount. Sale ends Monday, January 12, 2015. Shipping charges additional.